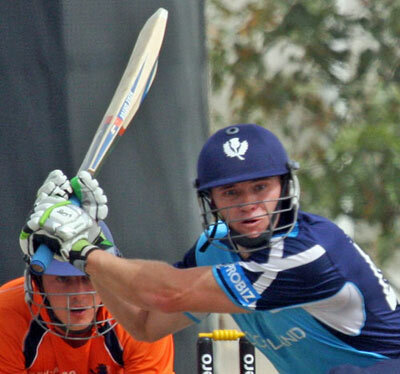 An unbroken 4th wicket stand of 153 between Richie Berrington and George Munsey led Scotland to a morale boosting seven wicket win against the Netherlands in their tour match in South Africa. Chasing 290 for victory, Scotland were always in control thansk to half centuries from openers Matt Cross (59) and skipper Kyle Coetzer (54). Calum MacLeod went cheaply but Berrington hit 3 fours and 4 sixes in a fluent 87 from 96 balls, while Munsey scored even quicker, as his unbeaten 73 came from just 65 deliveries (5 fours, 3 sixes). The Netherlands attack had no answer to the rampant Scots who won with an over to spare. There were further concerns for the Dutch ahead of the WCQ tournament as opening bowler Viv Kingma managed just 16 balls before limping off with an ankle injury. However coach Ryan Campbell allayed any fears that Kingma would miss the competition. The Dutch total of 289 was based around a superb century from Roelof van der Merwe, who crashed 9 fours and 5 sixes in a powerful 103 from just 57 balls. He shared a last wicket stand of 48 in just 22 balls with Viv Kingma, with Van Der Merwe thumping 44 of them in just 16 balls - Scotland seamer Stuart Whittingham bearing the brunt of his brutal assault. Earlier Ryan ten Doeschate made his first appearance of the South African portion of the tour, adding 69 with Scott Edwards as both players made half centuries. Scotland spinner Mark Watt was the stand-out performer on a batsman dominated day, taking 2 for 30. Both teams now jet off to Zimbabwe with the warm-up games starting early next week. Dutch skipper Peter Borren took to Twitter to declare his team's readiness for the cut-throat challenge. "Flying to Harare for @cricketworldcup qualifiers. These tournaments are ruthless and we are looking forward to the challenge. Can't wait to see our boys step up. This is what we play for."